Woodside Gardenshas been offering services to develop, improve and maintain natural landscapes for over 20 years. As landowners we have a choice to make. We can landscape our property in the traditionally way of a foundation planting around our house with a big lawn or we can choose to work with nature and landscape our properties in a way that reflects a more natural look. If you choose a natural garden, you will not be alone. Today, for many obvious reasons, more and more people are choosing to have a commitment to nature and a lifestyle that is more friendly towards the environment around them. By allowing nature to work with you, your property will be more diverse, it will be rich and beautiful. You will also put less stress on the environment by reducing your need for fossil fuels and man made chemicals. Natural landscaping does not mean letting everything go and giving free reign to the plants in your yard. 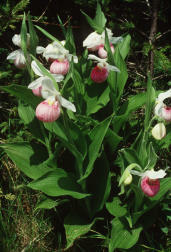 Many plants need care when young and cannot compete with invasive and aggressive species of plants. It does take time to develop a natural landscape, allowing the desirable plants to take hold and grow into the natural and beautiful landscape you in vision. Once established a natural landscape is much less work to maintain than the cold sterile looking landscapes we see in most yards around our communities. What is your next step? Use all the information on our site, develop a plan, hire us if you need help and join our growing group of homeowners all over the country that are changing to a more eco-friendly lifestyle. 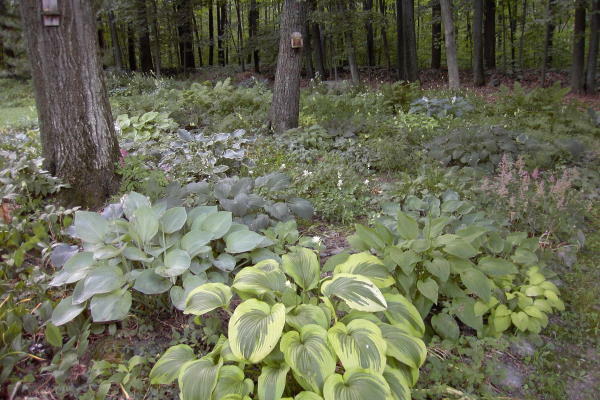 Hosta bed with yellow foxglove, ferns, lily of the valley, pulminaria and other perennials. What are the benefits of a more informal natural landscape. Outdoor Structures including Birdhouses & Feeders, Benches, Arbors, Sundials, Birdbaths, etc | Everything needed to Create & Maintain a Pond. We grow heritage tomatoes that we harvest for seeds, salads, and cooking. We loved our first crop of pear tomatoes, so we looked into the cost of buying pear tomato seeds and they are quite expensive. We decided to harvest our own seeds. We did it in a similar fashion to regular tomatoes, and tried growing them the next year from our own seed. We successfully grew pear tomatoes from the seeds we harvested. eWrought Iron specializes in wrought iron components and furniture for the European market. With online shops present in UK and France we plan to soon expand across Europe. Our aim is to diversify our offer with new wrought iron component designs Click & buy now at http://www.e-wroughtiron.co.uk. We strive for quality and a great aftersale service treating every client individually! No order too small, no request too dificult. We make the difference by being responsive and treating each and every client with utmost devotion and care. The gardens are great but End of Lease Cleaning Perth are the best at what they do. While this site would give you a knack of the process to build a natural landscape for outdoors, you can always contact Floworld if you need to decorate your home with natural fresh flower bunches like Orchids, Lillies or even roses. We've found a post you should check out. If you want to have a great WordPress magazine themes and you're having trouble getting started, this list of themes should really help get you started. It's a great resource for the very best themes around. Original Shelters specializes in all sorts of outdoor structures for home and agricultural use. They offer the very best in outdoor sheds, portable garages, livestock housing and much more. Chose from a great selection of prefab sheds available in metal, vinyl coated steel, fabric covered and wood. Looking for a place to store an auto or watercraft? Original Shelters offers a great selection of carports and garages that are readily available in do it yourself kits for easy set-up. There are many benfits over smoking, vaping that is. Personally, I use a Solo kit and eliquid from Vapage because it's USA ingredients. It tastes awesome, especially blue frost menthol and I don't even smoke anymore. Are you still using raffia for your tomato trellises? Comercial growers worldwide hacve shifted to using hortomallas netting rather than the old and labor intensive agricultural raffia twine. Many brands exist, but HORTOMALLAS beats them all since malla tutora tenax hortonova is a lot more expensive than hortomallas, besides HORTOMALLAS can be reused many cycles over, further diminishing the per crop cost. Using trellis netting will reduce the incidence of pathogens in your fields as there is less manual contact. 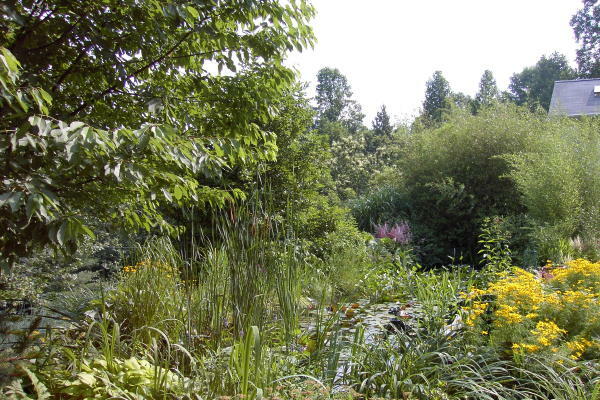 A small pond filled with water lilies, cattails,fish, frogs, dragonflies and surrounded by grasses, perennials, bamboo, shrubs and small flowering trees. This is an example of allowing a water garden to fill in naturally and provide shade and tranquility, even in a small yard in a busy neighborhood. Contact Us | Report Site Errors | Suggestions/Comments | Privacy Notice Visit The Registry of Nature Habitats and apply to admit your property.